Come home to Grandma’s house! Grandma used to decorate the fireplace and the dining room table with crab-apples and cranberries as the holidays approached. The delicious aroma of apple pie and cinnamon wafted from room to room. Crab-apples are festive and colorful. In this project Sharon will introduce students to a media known as Gouache. 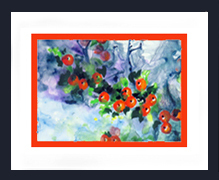 Gouache can be described best as an opaque watercolor. This media is used often in producing graphic artwork.